to become a pilot. Instead he ended up studying printmaking at the Artist Proof Studios in Newtown, for three years. Shabangu is a firm believer in community work. Among many other projects, he initiated the Non Profit Organisation, Makhekhe Mshini Youth Facility Management (MMYFM), near his home-town. The project hosts netball and soccer tournaments for the Mpumalanga youth. Printmaking (silkscreen) workshops are held once a year. In 2008, Shabangu’s work was chosen to represent the Many Voices, One Movement Global Conference at the O.R Tambo Airport. at Museum Africa in 2009. Early in 2010, Senzo Shabangu was the recipient of the David Koloane Award. As part of the award, he engaged in a four month residency at the Bag Factory, under the mentorship prestigious artists David Koloane and Pat Maut-loa. During the residency, Shabangu worked with resident artists from around the world. 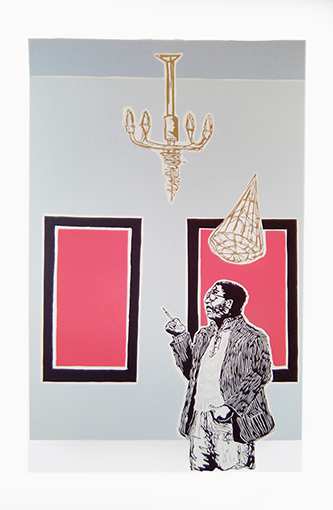 Shabangu began working on monotypes at the Arts on Main DKW with printer Jillian Ross, in 2010.
and suspended above his characters creating an almost claustrophobic sense of being surrounded by the city. Within this theme, Shabangu also deals with movement in the city and how people are moved. in preparation of his solo exhibition in the space, called Naked Pressure. His linocuts were shown at Arts on Main for the duration of the show. He continues to print at DKW creating new works for upcoming shows in 2012.